Well, Day Two, if you count getting to the airport hotel in Singapore around 2AM and not leaving the airport before my next flight to Bali. In my mind, this is my first real stop, and this chapter of My Year of Living Travelly is truly underway. Perhaps it is telling that there was a small earthquake this morning. Perhaps it was Bali saying hello. Last night I came after dark down a tiny road, to arrive at my hotel outside Denpasar. 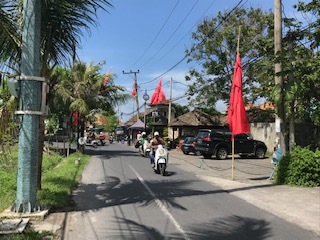 The scene around the airport was so honky tonk, so clearly created for tourist revels, and so un-Balinese (except for the phalanxes of motorbikes) that I felt a little dejected by my first impression. As a little aside, I read recently about how McDonald’s is so utterly predictable in the US, but abroad it actually reflects the culture. Indeed, so far so true. I saw a billboard showing a burger with the only familiar topping being a fried egg. There was also a platter of Mc Curry and McRice( no, it wasn’t really called that). I was so glad to get away from there and escape to the sight of trees in the headlights, and to that last tiny road to someplace real. And this morning, here I was. 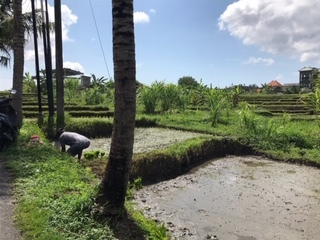 Every space that wasn’t occupied by road plus motorbikes, houses, or shrines was cultivated as small rice paddies. 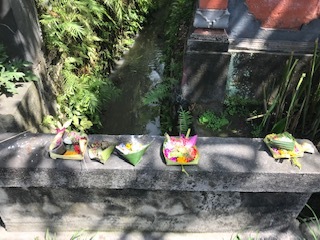 Every entryway to a home or business, even a driveway, and everyplace in between, was decorated with an offering to the gods. And everyone was busy, busy, busy with the new day. 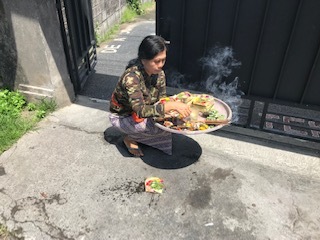 This woman kindly allowed me to take her photograph as she laid down little offerings of flowers, crackers and other tidbits, while incense wafted from the platter she carried. Other people waded through muddy rice paddies, pounded hammers, hung out laundry, or cooked breakfast in cafes.